Mulberry House is a completely renovated 1000-square-foot 19th-century carriage house located in the heart of Nashville. Nestled behind a three-story Victorian 'painted lady,' it is designed especially for travelers who prefer the ambiance of a guest cottage to that of a large hotel. Situated on Clifton Lane adjacent to 12th Avenue South, Mulberry House is three blocks from the hoppin' 12South restaurant and retail district, five minutes from the ultra-modern Gulch district, and only 10 minutes from downtown Nashville. In the immediate vicinity are parks (Battle of Nashville Memorial and Sevier Park) and bike paths linking as far as historic East Nashville. One of the nation's few urban wildlife preserves, the beautiful Radnor Lake, is four miles further out of town on 12th Avenue/Granny White Pike. The cottage is secluded in its own private courtyard and has the feel of a wooded retreat and secret garden. The original 1880s portion, which includes the bedroom, a bath with both tub and glass shower, and a fully equipped kitchen, features the original bead-board ceiling and rustic wood-plank walls. This older period section is enhanced by the new addition, a 500-square-foot great room complete with crossbeams, demi-lune window and cathedral ceiling. The spacious, light-infused room includes two comfortable seating areas, a media center, desk and a granite dining peninsula opening into the kitchen. Guests enjoy the privacy of a large, fenced courtyard garden, a stone-and-brick patio and a secluded rock garden. Wrought-iron furniture, a hammock and a porch swing facilitate outdoor dining, daydreaming and relaxation. The grounds of the main house, which is situated in a quiet urban neighborhood, include an original gazebo, herb and flower gardens and stately old trees. Mulberry House features a blend of styles and furnishings that reflect a modern sensibility. Bamboo floors, antique and contemporary furniture, original art, Oriental rugs and whimsical folk art and crafts grace the interior. Zen basins, copper rain-chains, Japanese lanterns and a magnificent Buddhist temple bell lend a tranquil, timeless aura to the garden. As your hosts, we have a personal interest in your comfort and enjoyment while you are guests at Mulberry House. We have traveled extensively in the U.S. and abroad and have enjoyed sabbaticals in Jerusalem, Tübingen, Kyoto and Hong Kong. Sojourns in facilities around the world have introduced us to many wonderful people and places. Inspired by these experiences, we have created Mulberry House to share the ideal qualities of the places we love--the hospitality of Southerners everywhere, the charm of a French country inn, the coziness of a German mountain chalet, the tranquility of a Japanese ryokan, the luxuries that distinguish a boutique hotel. As our guests will testify, we go out of our way to accommodate your individual needs and interests. Mulberry House is furnished with art and antiques from our former gallery, Antics. These and other fine and decorative arts and artifacts from our collection are available to guests for purchase, with Mulberry House guests receiving preferred pricing. Whether you are traveling for business or pleasure, Mulberry House offers a private, peaceful headquarters for your stay in Nashville. 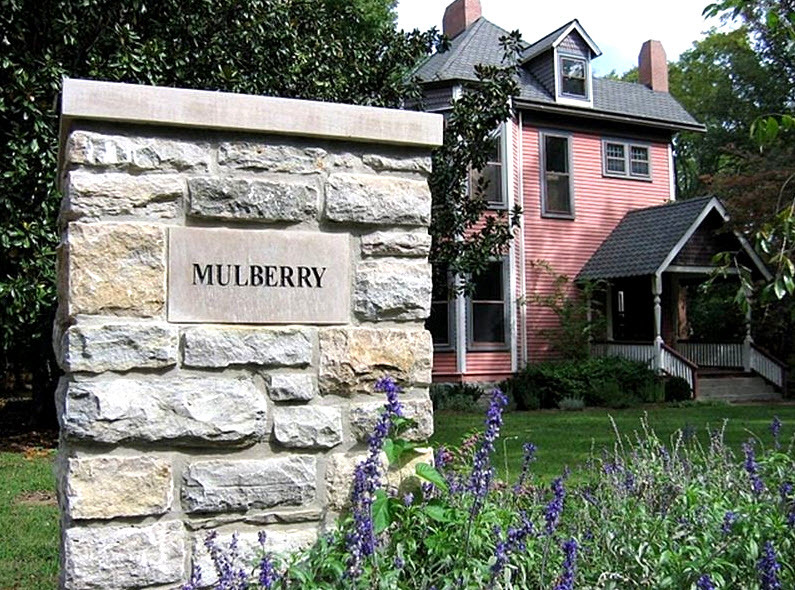 Nashville, Middle, Tennessee, USA - Conveniently located in an attractive residential neighborhood, Mulberry House is within a few miles of Music Row, Vanderbilt University, Belmont University, Lipscomb University, Green Hills (home of the famous Bluebird Cafe) and Hillsboro Village. Situated on Clifton Lane adjacent to 12th Avenue, it is 3 blocks from the refurbished 12South retail and restaurant district, 5 minutes from the ultra-modern Gulch district, and only 10 minutes from downtown Nashville. In the immediate vicinity there are parks (Battle of Nashville Memorial and Sevier Park) and bike paths linking as far as historic East Nashville. One of the nation's few urban wildlife preserves, the beautiful Radnor Lake, is 4 miles further out of town on 12th Avenue/Granny White Pike.